Gísla saga Súrssonar aka the saga of Gisli the outlaw. 38 chapters so not short enough to be a tale and not long enough to qualify as a ‘major’ saga, it is often considered the best of the ‘lesser’ sagas. Sur means ‘whey’ and derives not from his father’s name as was customary but from an event in his father’s life when the family farm was set on fire and Gisli and his father escaped using skins doused in whey. Hence the nicknames Sur and Sursson, and George Dasent in his sweet Victorian version refers to Gisli as ‘the Soursop’ and the family as ‘the Soursops’. Gisli’s saga overlaps with the Saga of the People of Eyri into which it intrudes in chapters 12 and 13. Whereas Gisli is the ‘hero’ of his saga to whom we become quite attached, it is odd and disorientating to read about him as a throwaway side-incident, peripheral to the lives of the people in the Eyrbyggja Saga. A technique revived in daring modernist and post-modernist narratives in the late 20th century but which was flourishing in 13th century Iceland. Gisli wins my unofficial prize for opening with the most bewilderingly unremitting bombardment of families, marriages, children, kith and kin of any of the sagas I’ve read. 1 – Towards the end of the reign of King Harald Fair-Hair (870-930) Thorkel Skearuaki lived in Surnadal with three sons Ari, Gisli and Thorbjorn. Ari marries Ingibjorg, daughter of Isi and, along with her dowry, comes a man named Kol, a man of high degree who had been taken captive and was now a slave. Meanwhile Bjorn the Black, a well-known berserkr, arrives with his posse and announces he will take over ownership of the farm and Ingibjorg unless Ari wants to fight him. Ari agrees a duel in which Bjorn kills him and prepares to assume farm and wife. But the second son, Gisli, steps in and challenges Bjorn in three days. Gisli asks Ingibjorg for help and she says her thrall, Kol, has a powerful sword. Kol reluctantly hands over the sword Grasida (Grey-blade) which he claims was made by dwarves and bites whatever it touches. In the duel Gisli kills Bjorn, then he and his men chase and kill all Bjorn’s followers. Gisli takes his brother’s farm and wife. Koll wants his sword back but Gisli refuses. Gisli offers Koll his freedom and stock for the sword but Koll refuses. They strike at each other simultaneously and Greyblade kills Koll and Koll’s axe kills Gisli, but not before Koll predicts this is just the beginning of bad luck which will dog Gisli’s kith and kin. 2 – The only surviving son of Thorkel, Thorbjorn, marries a woman named Thora and has a daughter Thordis, and three sons Thorkel, Gisli and Ari. Thorkel grows old and dies and Thorbjorn inherits his stock and the farm at Stokkar in Surnadal. Two young men also lived in Surnadal from different families and the same age as Thorkel, Gisli and Ari – namely Bard and Kolbjorn. They had both lost their fathers and inherited wealth. Word gets around that Bard has seduced Thordis. Thorbjorn disapproves and so does Gisli but Thorkel is a friend of Bard’s. Gisli was accompanying Thorkel and Bard back to Bard’s farm when, without any warning, Gisli kills him with one stroke. Father Thorbjorn is pleased but Thorkel is outraged and goes to stay with a relative of Bard’s, Skeggi the Dueller, on the island of Saxo. He encourages Skeggi to take revenge for his kinsman so Skeggi rides to suggest to Thorbjorn that he marries Thordis. Thorbjorn turns this down as Thordis is now matched to the other young man in the neighbourhood, Kolbjorn. Skeggi challenges Kolbjorn to a duel. When the day comes Kolbjorn bottles out but an outraged Gisli rides to Saxo on his behalf. No-one appearing Skeggi asks his carpenter to set up wooden effigies of Kolbjorn and Gisli, one behind the other, insultingly implying their homosexuality. At which Gisli emerges from the woods where he’s been watching to fight. Skeggi strikes at Gisli with the sword Gunnlogi (war-flame) then Gisli strikes Skeggi with his halberd and chops off his leg. Skeggi sues for peace and walks with a wooden leg the rest of his days (which aren’t very long). 3 – Skeggi has two sons, Einar and Arni who vow to take revenge for their father’s humiliation. they ride to see Kolbjorn in Aurnadal and say, if he doesn’t join them, they’ll kill him. So Kolbjorn joins the brothers and their posse of 60 (!) and rides to Stokkar where they set fire to the farm. Thorbjorn and his sons temporarily douse the flames in goatskins soaked in whey (hence the nickname Sur or ‘whey’) before knocking down a wall and fleeing under cover of smoke. 12 are burned to death. Gisli and his crew ride to Styrkir’s farm where they muster 40 men, ride to Kolbjorn’s house and burn him and his people alive. Then the Surssons sell their land and buy a ship and load all their goods and people. They sail north to Flyndrenes where 40 of them encounter Skeggi’s son in a group of 11 and massacre them all. Then ride on to the farm, takes all the goods and livestock and Gisli chops Skeggi’s head off. 4 – After 60 days at sea they land at the mouth of the Haukadalsa river. Thorkeil Eiriksson welcomes them and father Thorbjorn Sur (whey) builds a farm at Saebol. 5 – Mass of detail about settlers, their families, intermarriages and children. The farms Saebol and Hol are built next door to each other. 6 – At the Althing people talk about the finery worn by the men from Haukadal. Thorkel the Wealthy chats to Gest Oddleif who says he gives the posse three years and then they’ll no longer see eye to eye. Gisli is told this and bids the friends – Gisli, Thorgrim, Thorkel and Vestein – go create a turf arch and pledge blood brotherhood. However, at the last moment Thorgrim backs out of the pledge, saying he’ll have enough on his hands supporting Thorkel and Gisli his brothers-in-law, and cannot support Vestein; at which Gisli withdraws his hand and says he won’t support someone who won’t support his brother-in-law Vestein. 7 – Two merchants arrive with timber from Norway. Thorgrim son of Thorstein Cod-biter sends his son Thorodd to unload the timber who realises it is bad quality, complains to the Norwegians who murder him, then go to their lodging, eat and sleep. Thorgrim hears the news, sets out immediately, catches them in their sleep and kills them both. In the spring Thorgrim and his brother-in-law Thorkel fit out the Norwegians’ ship and sail to Norway. The same summer Gisli and Vestein set off. Thorgrim and Thorkel present themselves at the court of King Harald Grey-cloak where they are welcomed. Vestein and Gisli’s boat is shipwrecked. 8 – They meet Beard-Bjalfi who owns a trading ship, they buy a part-share and sail south to Denmark. Vestein announces he has to sail west to England to sort things out with his trading partner Sigurd. Gisli makes a silver coin which can be divided in two and pledges they will send their half to the other when one of them is in trouble. Vestain goes to England. Gisli and Bjalfi return to Norway, then to Iceland. 9 – Thorkel and Thorgrim arrive back in Haukadal on the same day as Gisli and they return to the farm. One day Thorkel is half sleeping in the long hall when he overhears women talking: Gisli’s wife Aud strongly implies that Thorkel’s wife Asgerd fancies Vestein; Asgerd says that Aud fancies Thorgrim. Thorkel is thunderstruck. That night he spurns his wife, eventually giving in. Aud tells Gisli what they’ve been talking about, and Gisli says Fate will decide. 10 – The brothers Thorkel and Gisli agree to split the farm, Thorkel takes the movable possessions and moves in with his brother-in-law Thorgrim. Gisli holds a grand Winter Days feast for all his kin. 11 – Thorgrim and Thorkel invite Thorgrim Nef, a sorcerer, to refashion the fragments of the sword Grafida, into a spear. —News arrives at Gisli’s feast the Vestein has arrived in Haukadale. Gisli sends messengers to him to tell him not to come to the feast, but they miss him. 12 – The messengers finally find Vestein but he has ridden so far it is easier to continue to Haukadale. He passes a succession of farmhands who warn him not to proceed. Arrived at Hol he unpacks presents for Gisli and Thorkel but when these are shown, Thorkel refuses to accept them. Gisli thinks everything is pointing in one direction. 13 – Gisli has two bad dreams. A big storm tears the roof off followed by a rainstorm and all the men go to protect the hay. Only Vestein is left there and in the night someone comes and kills him with a spear (presumably the spear made from Grasida (Ch 11). Gisli is sad. He tells his foster daughter Gudrid to go to Saebol and tell the news. She returns to say both the Thorgrims and Thorkel were sitting fully armed. 14 – Gisli and his men build a mound for Vestein in the sandbank on the far side of Seftjorn pond below Saebol. Thorgrim volunteers to tie on his Hel-shoes. 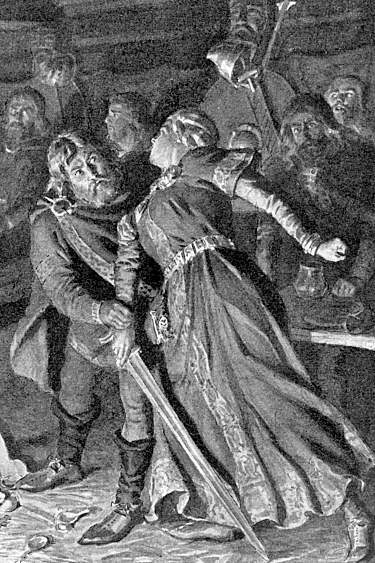 A strange dialogue between Gisli and his brother Thorkel (who is surely number one suspect) in which Thorkel asks after their sister, Aud, Vestein’s widow – and Gisli agrees to be civilised and restrained as long as Thorkel is as restrained if anything ever happens to pain him as much as Vestein’s death pains Gisli. 15 – The summer games continue and Gisli bests Thorgrim in the violent ball game. Thorgrim says a verse looking at Vestein’s mound which seems to implicate him. — Thorgrim decides to hold a feast to celebrate the Winter Nights and sacrifice to Frey. Gisli, at the neighbouring farm, also organises a feast and invites all his kin. Thorgrim suggests to Thorkel they ask Gisli for the tapestries Vestein brought back from abroad but which, at the time, Thorkel turned down (Ch 12). Thorkel acquiesces. Thorgrim orders Geirmund to go get them and when Geirmund hesitates, slaps him hard in the face. Geirmund goes to Gisli’s and asks and Gisli gives them, himself carrying them as far as the hayfield fence; where he asks Geirmund a favour in return: to leave open three doors into Saebol. 16 – In a really atmospheric scene Gisli dresses in black, takes the spear Grasida that killed Vestein, sneaks down to the stream which separates the farms, up to Saebol, sneaks in through the byre then through the darkened hall into the bed closet of Thorgrim and Thordis and waits over their bed till Thorgrim stirs, then pulls the bedclothes off and transfixes him to the bed with the spear then, as Thordis awakes screaming, sneaks out, back the way he came, locking the doors, down to the stream and so back to his own farm where he slips into bed. 17 – Thorgrim’s guests are drunk and confused. They remove the spear and make a mound for the body. Then a big number of them go to Hol to wake up Gisli and tell him. In an unusually percipient detail, Thorkel sees Gisli’s shoes are wet with snow and ice, and pushes them under the bed so nobody else can see them. Gisli offers to finish Thorgrim’s mound and, after they’ve laid Thorgrim’s body in a ship, Gisli carries a massive boulder up the mound and throws it on the ship, smashing it. 18 – Thorgrim’s wake, drinking. Thorgrim’s brother Bork the Stout pays Thorgrim Nef to sacrifice a nine year-old ox in a pagan ritual to ensure that no matter who tries to give help to the slayer of Thorgrim it will be to no avail. The brothers hold joint winter games. Bork moves in with Thordis ie his brother’s widow and marries her. She gives birth to Thorgrims son, at first named Thorgrim but who proves so unruly his name is changed to Snorri. The games coninue all day with particular rivalry between young Thorstein and Bork. Gisli is fixing Thorstein’s broken bat when he very unwisely recites a poem which more or less admits his responsibility for murdering Thorgrim. His sister Thordis overhears it, goes home and deciphers it. 19 – The strange episode of Audbjorg, sister of Thorgrim Nef, the sorcerer who recast the fragments of Grasida into the fateful spear. Her son Thorstein and a man called Berg argue about the games until Berg hits Thorstein who goes home to Audbjorg bleeding. She walks backwards round her house chanting until an avalanche falls on Berg’s house killing him and all within. Bork hears about this, goes to her house, has her seized and stoned to death and buried at Saltnes. Gisli rides to Nefstadir where a sack is placed over Thorgrim Nef’s head and he too is stoned to death, and buried next to his sister. Bork decides to move to Thorsnes and rides part of the way there with Thordis, his wife, Thorgrim’s widow, Gisli’s sister. At Thorgrim’s mound she repeats Gisli’s verse and Bork quickly deciphers it and is furious. He wants to ride straight back and kill Gisli. Thorkel is with them and persuades Bork to ride on south. Claiming he has to drop in on an old friend Thorkel rides fast to warn his brother Gisli that the matter is now out in the open. Bork settles into his farm at Thorsnes. Next Summons Days Bork summons Gisli to the Thorsnes Assembly. Again Thorkel makes his excuses to ride off and warn his brother. 20 – While Bork prepares a case to go before the Thorsnes Assembly, Gisli sells his land to Thorkel Eiriksson. He confers with his brother Thorkel. Thorkel will tip him off of all attacks but won’t actively help him and thus expose himself to ruin. Gisli sets off with two cart horses and a sled piled with valuables making for hte woods. he eschanges his cloak with his slave Thord the Coward and makes Thord sit high up on the sled. Predictably Bork and his men pursue Thord to the edge of the woods and kill him, realise it’s only Thord, and then make after Gisli. As they attack him Gisli kills Thorodd and Thorgrim the Norwegian. Bork goes to Gisli’s homestead and begin proceedings. When Bork has gone Gisli returns home, loads all his things into a small boat, and rows across miles to a small fjord where he builds a homestead. 21 – Gisli sends words to Vestein’s uncles asking them to offer a settlement at the assembly. But the foul it up and Gisli is outlawed. Gisli speaks three good verses. The two Thorkels will help him so much and no further. He spends three years at Geirthjofsfjord, and then three years travelling round iceland trying to get support from chieftains. But Thorgrim Nef’s spell works and no-one will help him. Six years pass in a variety of hideouts. 23 – Bork gets cross with Eyjolf who he has paid good money. Helgi the Spy recognises Gisli in a hideout in Geirthjofsfjord but when Bork arrives with men he has gone. Gisli asks his brother for help one last time, gets cloth and silver and departs. He goes to stay with Gest Oddleifsson’s mother Thorgerd. 24 – In the spring he returns to Geirthjofsfjord to be near his wife Aud but is troubled by bad dreams. He recites poems about them. He alternates between Geirthjofsfjord and Thorgerd’s hideaway. He goes to see his brother one last time, borrows his boat and departs prophesing Thorkel will die before him, then rows out to the island of Hergilsey where he stays with his cousin Ingjald. 25 – Gisli stays with Ingjald several years. Ingjald has an idiot son who is chained to a millwheel and left to graze, and two slaves. Gisli makes him wonderful things including three boats but these prompt suspicions that Gisli is there. Bork sends Eyjolf to the island of Hergilsay. Gisli hides but Eyjolf sees food being served up ready to be taken to his hiding place. Eyjolf is ferried back to the mainland, alerts Bork who sets off with a posse. 26 – Ingjald is out fishing with Gisli when they see the boat with Bjork in approaching. Gisli persuades Ingjald to divide the boats, he and the idiot rowing to shore and going uphill while Gisli stays with the female slave, Bothild, and pretends to be the idiot. This occasions a lot of mirth from Bork’s men as they go by seeking directions. Of course they beach the boat and follow the figures till they realise they’re not Gisli and Bork is furious. It is said Ingjald was a good supporter of Gisli. When Thorgrim Nef cast his spell denying support to Gisli it applied to men on the mainland, he forgot about islands and so Ingjald wasn’t affected. 27 – Bork, contemplating the idiot, is humiliated by the whole trip. They jump into their boat and set off in pursuit of the other boat. 27 – Bothild rows Gisli to Hjardanes where he leaps ashore and runs up the ravine. Outlaw-Stein is the first out of the boat pursuing Gisli who turns and kills him with a swordstroke. Then he jumps into the water intending to swim to the mainland but is hit in the calf by a spear from Bork. He pulls it out and manages to swim across and limp up into the woods, encircled by Bork and his men. He manages to slip down to a beach under cliffs and makes it along to the house of Ref and Alfdis who agree to hide him, viz by Gisli hiding in their bed and, when Bork and his men search the place, she yells out fishwife abuse which puts them off until they leave. Gisli stays with Ref for two weeks and gives him present of a knife and belt when he leaves and returns to his wife at Geirthjofsfjord. His reputation is enhanced. Bork looks like a fool. 28 – The Thorskafjord Assembly. Two poor young men hitch a ride in Gest Oddleifsson’s boat. They ask to stay in the booth of Hjallborn the wanderer and ask famous men to be pointed out. They go to the booth of Thorkel, as to see his sword, and promptly behead him! Everyone runs off in panic and one of the two men, Helgi, says they seem to be discussing whether Vestein left only daughters or also sons ie they are Vestein’s sons taking revenge. I am puzzled. I didn’t think Thorkel killed Vestein, I thought Thorgrim did (though I’m confused why he did since it was Thorkel’s wife who he overheard saying she fancied Vestein ie nothing really to do with Thorgrim). 29 – Gest discourages Bork from pursuing the killers; everyone thinks Gest was in league with them as Vestein was a kinsman. Once again Bork is made to look foolish. The killers flee to Gisli’s (?). 30 – Aud sends them over the hills to Bjartmar’s sons. Gisli says, Good, otherwise he would have had to kill them.— Gisli’s bad dreams return.Gisli makes verses about his visions. 31 – Helgi is sent again to spy on Geirthjofsfjord and takes a man named Havard. Turns out he is loyal to Gisli. Once when they spy a campfire and Helgi builds a cairn to mark the spot, Helgi dismantles it and drops a boulder nearby as if from Gisli so that Helgi flees and when he returns with Bork there is no cairn so they can’t triangulate to the place they saw the fire. Bork goes to see Aud and offers her 300 pieces of silver and a good marriage if she’ll betray Gisli. 32 – Gudrid, his foster-daughter, rides to warn Gisli that Aud is betraying him. Gisli makes a verse saying she will always be true. When she has put his silver in a purse Aud stands and smacks Eyjolf in the face with the purse drawing blood. He shoults for her to be killed, but Havard steps in and persuades the men against it. Aud gives Havard a gold ring for his loyalty. Havard leaves Eyjolf’s service and rides south to join Gest Oddleifsson. 33 – Gisli has more and more dreams, torn between good-woman and bad-woman who threatens blood and death. He makes verses about them, and becomes scared of the dark (just like Grettir). 34 – The summer passes and on the last day Gisli has more bad dreams and takes Aud and Gudrid south towards a hideout. He recites a verse of his most recent bad dream. And indeed Eyjolf had approached the homestead and now followed their trail in the frost. Gisli and the woman scramble to the top of the ridge to make a stand. Eyjolf tells Helgi to attack Gisli who promptly chops him in half. Eyjolf scrambles up and Aud hits him hard in the arm with a club, to Gisli’s praise. 35 – Gisli holds off the 12 men, killing four, before scrambling higher onto the ridge named Einhamar. 36 – Gisli wounds all of them but they renew the onslaught and injure him until his guts spill out. He recites his last verse, jumps from the crag onto Eyjolf’s kinsman Thord, killing him, and breathes his last. Summary of the dead. They bury Gisli under a stone mound and offer to take Aud but she refuses. 37 – Eyjolf goes to Helgafell to meet Bork who welcomes him and tells his wife Thordis to rejoice. Thordis is, of course, Gisli’s sister. When she serves food to the men she seizes Eyjolf’s sword and tries to kill him but it strikes the table and she only injures him in the thigh. Eyjolf claims full compensation and goes away very unhappy. Thordis divorces Bork in front of witnesses, and moves away. Bork lives at Helgafell until driven out by Snorri the Priest. 38 – Postscript. Vestein’s sons get Gest Oddleifsson to get them out of the country along with their mother Gunnhild, Aud, Ingjald’s daughter Gudrid and son Geirmund. They sail to Norway. Berg is walking round town when buttonholed by a man, and tells who he is. The man strikes him dead on the spot as he is Ari, brother to Gisli and Thorkel, thus revenging Thorkel’s murder. Vestein’s other son Helgi flees to the ship and gets a ship to Greenland where he becomes prosperous. Aud and Gunnhild go to Hedeby in Denmark, convert to Christianity, and go on pilgrimage to Rome. Geirmund stays in Norway and prospers. Gudrid marries and has many descendants. Thorgrim, son of Thorstein Cod-biter, marries Thordis the sister of Gisli and Thorkel. He is Gisli’s son-in-law. Thorgrim and Thordis move into the farm at Saebol. Gisli and Thorkel build a farm at neighbouring Hol. Gisli marries Aud, Vestein’s sister. Vestein is Gisli’s brother-in-law. They swear special friendship and split a special silver coin. When Vestein is murdered, Gisli must take revenge on the murderer, even though it is his own brother-in-law, Thorgrim. Thorkel, Gisli’s brother, marries Asgerd. He is associated with the murder of Vestein and that is why he is eventually killed by Vestein’s sons. Translated into good, clear modern English by Martin S Regal, and included in the excellent portmanteau Penguin volume, The Sagas of the Icelanders. There are two main traditions of the text: the Penguin version translates the shorter, more focused one; the Victorian translation, linked to below, translates the longer one which has more circumstantial detail in the opening chapters, eg about the sword Grey-blade and the curse the dying Kol lays on Gisli’s family. This is, frankly, more interesting. In throwing out the cod-medievalisms of the Victorian version, in order to become fast, no-nonsense modern prose – a little like a modern thriller – the Penguin version loses by discarding the folk tale feel, the dwarves and magic of the Victorian version.